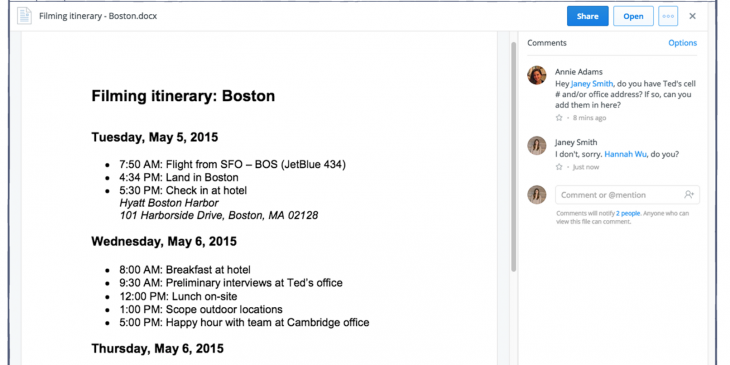 Dropbox has announced that all users will soon get its new commenting feature. The option debuted in March, but has only be available to Dropbox for Business Early Access customers until now. The feature, which allows you to add comments to Dropbox files and have conversations in the side-pane, can also be disabled for individual documents, allowing a degree of granularity. To use it, you just need to @ mention another person (delivered via email, if they’re not Dropbox users) and await a response. You can also mute conversations on certain documents, so that you no longer receive those particular notifications. For now, the commenting feature only works on the desktop site, but the functionality will be added to its native mobile apps “soon,” Dropbox says.